Nexus 7 has sold just 3 million units, disappointing Google as the user behavior is slowly shifting from 7 inch to 8 inch tablets. With the possible release of Nexus 8, it will be directly in competition with Apple iPad mini, Samsung Galaxy Note 8.0, Galaxy Pro Tab 8.4 and LG G Pad 8.3. 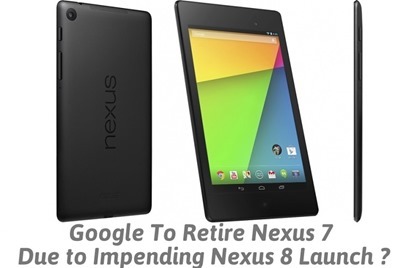 Reportedly, Nexus 8 would be loaded with Android 4.5 (or Android 5.0, whatever Google chooses to name it). Another report claims that Nexus 8 would ditch Snapdragon processors from Qualcomm and choose Intel instead. In case Intel is chosen, then it is being speculated that Moorefield chip with top speed of 2.33 GHz can be a possibility which can also give a boost to the tablet’s graphic department with its PowerVR G6430 graphic engine. Android 4.3 was named Jellybean, 4.4 was named KitKat; hence the next version of Android which is 4.5 can be named with a letter L. And some forecasters have predicted that the name can be Lollipop or Lemon Meringue Pie considering that Google always name new versions of Android based on desserts. Previously Google had named updates such as Cupcake, Donut, Eclair, Froyo, Gingerbread, Honeycomb and Ice Cream Sandwich. The new 8 inch tablet can be launched during Google I/O, a developer’s conference which will start from June 25th in San Francisco. In case Nexus 8 is launched, it will be supported by launch of Nexus 10-2 as well, which will also support Android 4.5 version. The next version of Android – either 4.5 or 5.0 will have enhanced battery life, speed and a new Android RunTime or ART as default among other updates. Google engineers have been focusing more on the ART environment, which can ensure faster application performance due to ahead of time compilation and better battery life as the demand for CPU is lessened. These are still speculations as of now, as another theory states that Google can ditch selling tablets all together and focus entirely on Google Play Edition variants of third-party devices, which can give better revenues with less investments. This is sure that Google has some long term plans related with tablets, and the year will end with lots of action in this regard. Do you think that Google should really retire Nexus 7 and focus solely on 8 and 10 inches tablets? Do share your views!